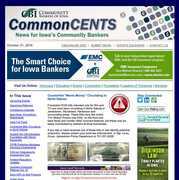 CommonCENTS is a weekly e-newsletter published each Friday. CBI attempts to submit as many different viewpoints as possible to provide you with information on the banking industry, as well as news on CBI Members and events. We're always looking for great content! If you have news, events or other announcements that are timely and relevant to the community banking industry and CBI members, send it for consideration to be included in CommonCENTS. The deadline to submit materials is 5:00 pm Wednesday to be published Friday of each week. Refer to our 2018 Media Guide for further details and guidelines.